Achaemenid architecture (Persian: includes all architectural achievements of the Achaemenid Persians manifesting in construction of spectacular cities used for governance and inhabitation (Persepolis, Susa, Ecbatana), temples made for worship and social gatherings (such as Zoroastrian temples), and mausoleums erected in honor of fallen kings (such as the burial tomb of Cyrus the Great). The quintessential feature of Persian architecture was its eclectic nature with elements of Assyrian, Egyptian, Median and Asiatic Greek all incorporated, yet producing a unique Persian identity seen in the finished product. Achaemenid architecture is academically classified under Persian architecture in terms of its style and design. The edifice, or the "small house" is a rectangular, elongated cube that lies directly on top of the pyramidal stone steps, and is six and a half feet (2.0 m) in width, six and a half feet (2.0 m) in height, and 10 ft (3.0 m) in length. The inside of the edifice is occupied by a small chamber a few feet in width and height, and around ten feet deep. It was inside this chamber where the bed and coffin of Cyrus the Great would have been situated. The edifice has a pediment roof possessing the same length and width dimensions as the edifice itself. Around the tomb were a series of columns, the original structure which they supported is no longer present. Arrian's direct testimony indicates that Cyrus the Great was indeed buried in the chamber inside the edifice, as he describes Alexander seeing it during his visit to Pasargadae, but it is also a possibility that the body of Cyrus the Great had been interred below the structure, and that the tomb seen on the top is in fact a cenotaph or a false tomb. A so-called "swallow-tail" (or "dovetail") staple. This is an early, huge example of staple used in architecture in order to fasten stones together. The most impressive hall in the complex is the Apadana hall, occupying an area of about 109 square meters with 36 Persian columns, each more than 19 m tall. Each column is fluted, with a square base (except a few in the porticos), and an elaborate capital with two animals supporting the roof. The structure was originally closed off from the elements by mud-brick walls over 5 meters thick and over 20 meters. The columns have a composite capital depicting addorsed bulls or creatures. Those columns in the porticoes not only would possess a circular base, but would also have an ornate capital after the end of the fluting, only to be curtailed by detailed addorsed bulls, supporting the roof. Even to date the structure is not safe from destruction and vandalism. After the Iranian revolution, a group of fundamentalists serving Khomeini, including his right-hand man Sadegh Khalkhali, tried to bulldoze both the renown Persian poet, Ferdowsi's tomb, and Persepolis, but they were stopped by the provisional government. ^ Fallah'far, Sa'id (2010). The Dictionary of Iranian Traditional Architectural Terms (Persian: فرهنگ واژه‌های معماری سنتی ایران). Kamyab Publications. p. 44. ISBN 978-964-350-316-1. Archived from the original on 2012-07-13. ^ a b c d e f g Marco Bussagli (2005). Understanding Architecture. I.B.Tauris. p. 211. ISBN 9781845110895. ^ a b Charles Gates (2003). Ancient cities: the archaeology of urban life in the Ancient Near East and Egypt, Greece and Rome. Psychology Press. p. 186. ISBN 9780415121828. ^ a b c d Ronald W. Ferrier (1989). The Arts of Persia. Yale University Press. pp. 27–8. ISBN 0300039875. ^ a b c d e f g h i j k James Fergusson (1851). The palaces of Nineveh and Persepolis restored: an essay on ancient Assyrian and Persian architecture, Volume 5. J. Murray. pp. 214–216 & 206–209 (Zoroaster Cube: pp. 206). ^ a b c d e ((Grk.) Lucius Flavius Arrianus) (En.) Arrian – (trans.) Charles Dexter Cleveland (1861). A compendium of classical literature:comprising choice extracts translated from Greek and Roman writers, with biographical sketches. Biddle. p. 313. ^ a b c d e f g h i j Aedeen Cremin (2007). Archaeologica: The World's Most Significant Sites and Cultural Treasures. frances lincoln Ltd. pp. 227–29. ISBN 9780711228221. ^ Ralph Griffiths; George Edward Griffiths (1816). The Monthly review. Printers Street, London. p. 509. ^ a b Andrew Burke; Mark Elliot (2008). Iran. Lonely Planet. p. 284. ^ James D. Cockcroft (1989). Mohammad Reza Pahlavi, Shah of Iran. Chelsea House Publishers. ISBN 9781555468477. ^ Ralph Graves (October 15, 1971). "A stunning setting for a 2500th anniversary". Life magazine. ^ a b c d e Ilya Gershevitch (1985). The Cambridge history of Iran: The Median and Achaemenian periods, Volume 2. Cambridge University Press. pp. 392–398. ISBN 9780521200912. ^ a b c R. Schmitt; D. Stronach (December 15, 1986). "APADANA". Encyclopedia Iranica. Retrieved Jan 23, 2011. ^ a b George Boys-Stones; Barbara Graziosi; Phiroze Vasunia (2009). The Oxford handbook of Hellenic studies. Oxford University Press US. pp. 42–47. ISBN 9780199286140. ^ a b c d e L. Mays; M. Moradi-Jalal et. al (2010). Ancient Water Technologies. Springer. pp. 95–100. ISBN 9789048186327. ^ Laura Foreman (2004). Alexander the conqueror: the epic story of the warrior king, Volume 2003. Da Capo Press. p. 152. ISBN 9780306812934. ^ Solomon Alexander Nigosian (1993). The Zoroastrian faith: tradition and modern research. McGill-Queen's Press. pp. 47–48. ISBN 9780773511446. ^ N. N. Ambraseys; C. P. Melville (2005). A History of Persian Earthquakes. Cambridge University Press. p. 198. ISBN 9780521021876. ^ Reza Aslan (April 30, 2006). "The Epic of Iran". New York Times. Retrieved Jan 30, 2011. ^ Georges Perrot; Charles Chipiez (1892). History of art in Persia. Chapman and Hall, limited. pp. 336–43 & others. ^ a b c d Giulio Carotti (1908). A History of Art. Duckworth & Co. pp. 94–7. ^ a b David Noel Freedman; Allen C. Myers; Astrid B. Beck (2000). Eerdmans dictionary of the Bible. Wm. B. Eerdmans Publishing. p. 1258. ISBN 9780802824004. ^ a b c Gene Ralph Garthwaite (2005). 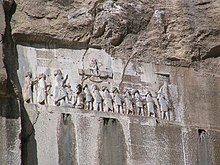 The Persians. Wiley-Blackwell. pp. 51–55. ISBN 9781405144001. ^ a b c d e f Paul Kriwaczek (2004). In Search of Zarathustra: Across Iran and Central Asia to Find the World's First Prophet. Random House, Inc. pp. 88–90. ISBN 9780307426352. ^ Ali Sami (1956). Pasargadae: the oldest imperial capital. Musavi Printing Office. pp. 90–94. ^ John Kitto; Henry Burgess; Benjamin Harris Cowper (1856). The journal of sacred literature and Biblical record, Volume 3. A. Heylin. pp. 183–5. ^ a b c Philip Smith (1865). A history of the world from the earliest records to the present time: ancient history, Volume 1. D. Appleton. p. 298. ^ J. Poolos (2008). Darius the Great. Infobase Publishing. pp. 38–9.